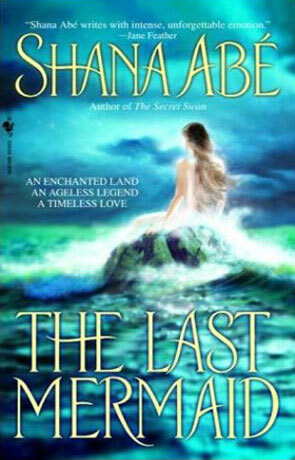 The Last Mermaid is a historical fantasy drama by Shana Abe. In 531 on the island Kelmere of the Kingdom of Isles, Picts ambush the royal party as they near their keep. Prince Aedan, heir to the High King throne, is stabbed trying to save his younger sister. When Aedan next awakens he finds himself battered in a strange bed and room. He meets his hostess Ione who brought him from the sea to her island, something she has never done before. Aedan realizes he is on Kell, the legendary forbidden island. Ione explains that they are the only living souls on the isle and that she is the Siren of Kell. Ione proves she is a mermaid by taking him to the sea before they make love. Though he wants to stay with her, Aedan builds a vessel because he needs to go home to help his people. She says she will die if he leaves Kell, but he insists curse or not he must do the right thing. However, the betrayal he finds at home will surely devastate him almost as much as leaving behind the female he loves. The key to this delightful historical romantic fantasy is that he lead couple seems genuine, critical for the siren-mermaid to come across as a real person that blends nicely into the Dark Ages in the Scottish Isles. The story line is fun to follow regardless of the isle that the action occurs on. Fans will appreciate this charming adult version of the Little Mermaid and readers would like to see more stories set in this realm. Written on 13th April 2004 by TC.